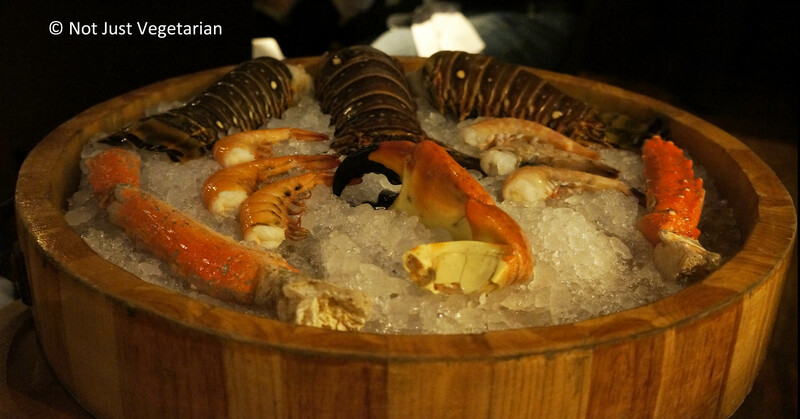 Where can one find fresh seafood in Cancun? There are plenty of restaurants serving fresh seafood, I suppose. One of those many, for sure, is Fred’s House Seafood Market & Grill. 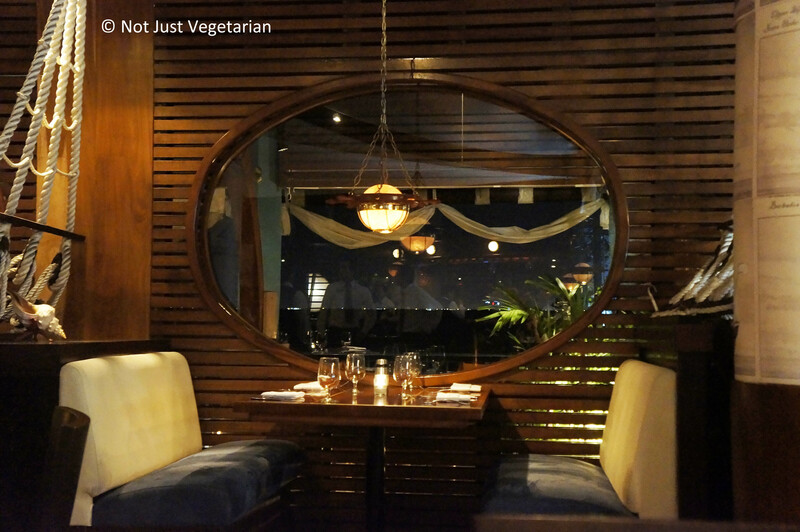 Fred’s House is a stand-alone, casual, seafood restaurant in the Hotel Zone, right across from the J W Marriott Hotel. 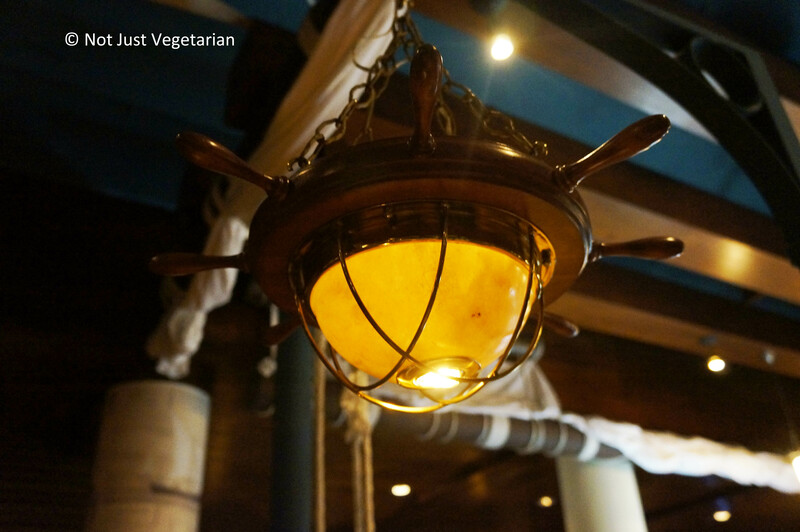 While it is a casual seafood restaurant it’s no shack or Margaritaville; it’s upscale, expensive, and serves incredibly large portions. Had this restaurant been in NYC, I would definitely have taken home left-overs from this meal and savored them later. See the detailed menu here. 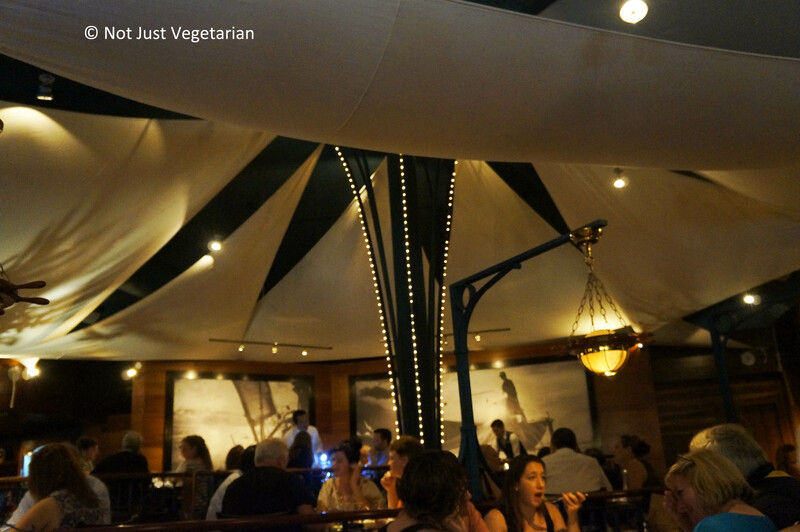 The decor and furnishings mimic that of the interior of a boat / ship and overall, it feels great to be inside. Fred’s House is packed with people as late as 10 PM on a week day. Make sure you have reservations before you go, to avoid a wait. When you enter, you will see fresh seafood on display on ice or in tanks. Once we ordered our drinks, we shown the contents of Fred’s seafood platter. We knew that it was that it was way too much food for the two of us. 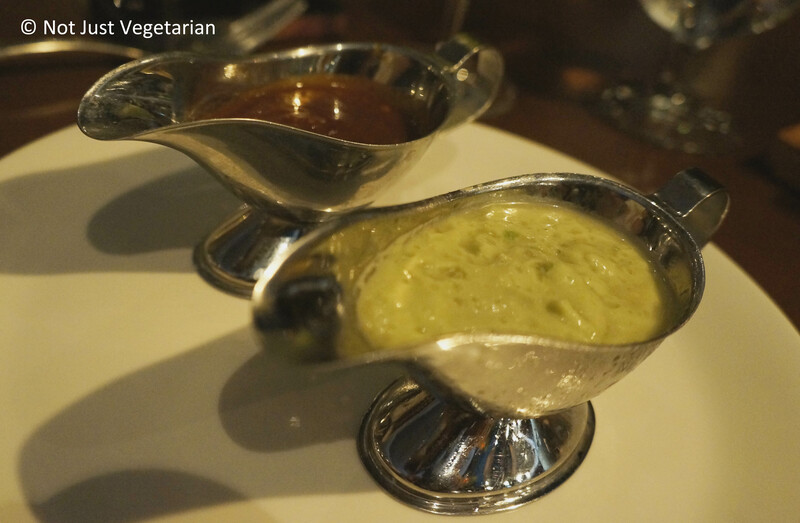 We had heard very highly about the octopus in coriander butter sauce, so, we wanted to make sure we had enough room for it after the appetizers. While we were still thinking about what to order – there is plenty to choose from – some freshly baked bread arrived. There were three rolls – plain, jalapeno and onion. 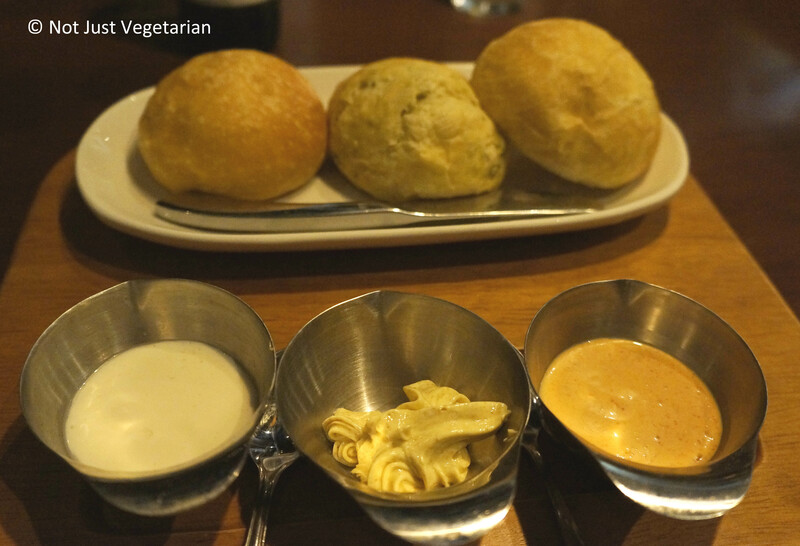 These were accompanied by three spreads – chipotle mayo, coriander (cilantro) butter, and a garlic spread. These were awesome to say the least. My favorite was the jalapeno roll with the coriander butter sauce. The next favorite was the onion roll with the chipotle mayo. There is something delicious and comforting about spreading smooth butter / mayo on warm soft bread (unless you have a gluten allergy). Good bread with a spread makes you feel like you will enjoy the food at the restaurant. Apparently, I am not the only person who thinks so. See this post by Epicurious about an increased focus on bread served at restaurants as a trend for 2013. 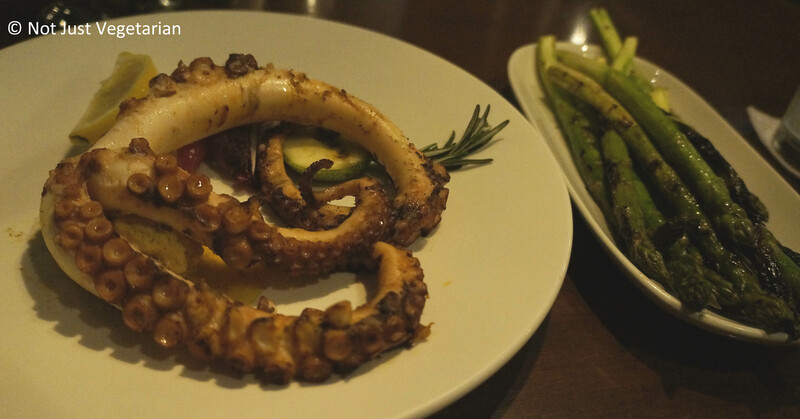 After spending a few minutes agonizing over whether we wanted any of the three \ carpaccios (salmon, tuna, and octopus), we ordered the Fred’s salad, Blackened Fish tacos, and of course, the Chef’s special of Octopus in coriander butter sauce and some grilled asparagus as a side. Had we known about the large portion sizes, we would have ordered fewer dishes. While we were waiting for our food, we were served a shrimp soup with compliments from the Chef. It was delicious and tasted like well seasoned tomato soup with shrimp broth. 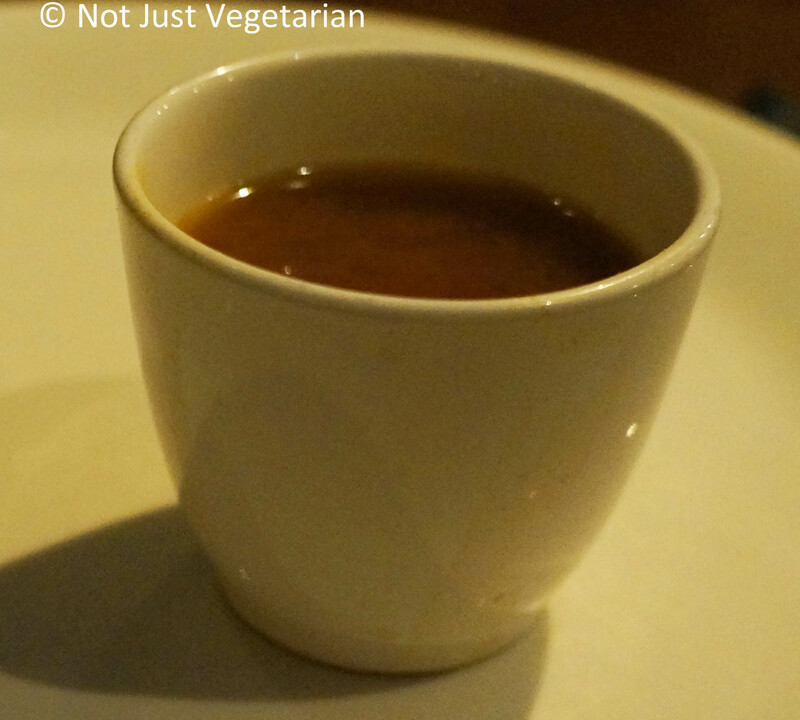 It was very light and set a positive tone for the rest of the meal. Fred’s salad had goat cheese, pistachios, walnuts, cranberries, and mixed lettuce in a mango-lychee dressing with curry. 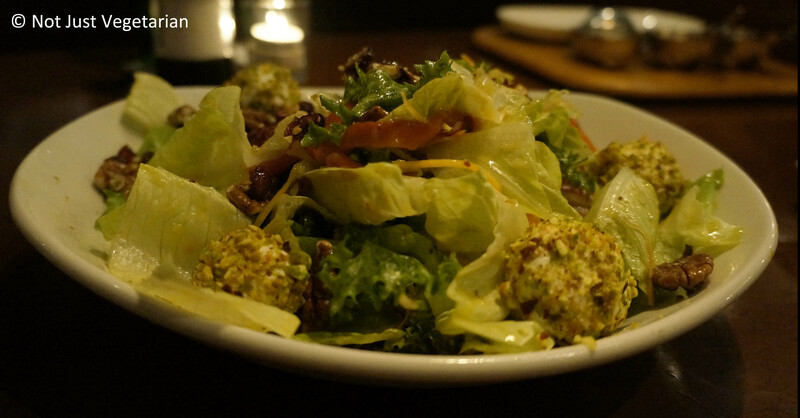 The salad was a beautiful combination of wonderful textures: soft goat cheese balls coated with crunchy pistachios, and the sweet tartness of the cranberries in the mango-lychee dressing made me feel well-fed for the evening. I could not taste the curry in the salad, but then, who cares when the rest of it is so appetizing? This salad was so large that it can be a meal in itself. Blackened fish tacos arrived as four thick soft corn tacos, filled with fresh shredded cabbage and chopped cilantro with pieces of grouper (also the catch of the day) grilled on a charcoal grill. This is one of the freshest dishes that I have ever had. The blackened pieces of grouper were soft, well-seasoned with spices (mostly chipotle chilies, and salt and black pepper as I can recall from the taste) and were fantastic overall. The tacos were served with two sauces – chipotle and avocado. The tacos were a meal by themselves. We were keen to eat the Chef’s special that we had ordered and so, did not finish this dish. Now for the highlight of the evening. The Chef’s special of the Octopus in coriander butter sauce was simply awesome. This is a “Must-order” dish at this restaurant. This was a huge portion of octopus served with lime wedges. The octopus felt soft and chewy and not stringy or smelly (as it is often at restaurants). The coriander butter sauce was mild, but I bet that the butter had a heavy role in making this dish as delicious as it was. The chipotle and avocado sauces were appropriate accompaniments to the octopus too, although one did not really need them. Not finishing the appetizers served us well to enjoy this dish. Oh, and I almost forgot about the grilled asparagus that we ordered. The asparagus was our attempt to get some fiber into our otherwise not vegetarian meal. The asparagus spears were not the slimmest ones that I have seen, but were very fresh and charred beautifully. Definitely worth ordering as a side. If you were keen to enjoy a dessert, there are plenty of options. The concierge at our hotel highly recommended getting an Apple pizzette, but we were just too full to have any dessert. Note to Vegetarians: The options for you are extremely limited, but you know that already when you head to a seaside spot for a vacation and would have set your expectations appropriately. If Fred’s salad and the grilled asparagus are representative of all the vegetarian dishes at Fred’s House, make sure you order all the sides and you will not go wrong. See the detailed menu for more sides that we did not order. Why would you go to Fred’s House Seafood Market & Grill? the ambience seems lovely….maybe i should taste the octopus one of these days. of course, i have no immediate plans of visiting cancun.